We have made great steps toward eliminating poverty around the world – extreme poverty has declined significantly and seems on track to continue to do so in the next decades. Jim Yong Kim of the World Bank estimates that extreme poverty can be eliminated in 17 years. This is clearly cause for celebration. However, this good news can make us oblivious to the fact that there are, in the United States, a significant and growing number of families who live on less than $2.00 per person, per day. That figure, the World Bank measure of poverty, is hard to imagine in this country – most of us spend more than that before we get to work or school in the morning. In $2 A Day, Luke Shaefer and Kathryn Edin, whose work defining extreme poverty in this country has received widespread attention, call attention to a trend that has had little traction in the aftermath of welfare reform. How does the social safety net fail these citizens? What are the implications of the tradeoffs they must make? As Michael Harrington set out to do forty years ago in his landmark book, The Other America, Shaefer and Edin alert us to the fact that there are, in this wealthiest of nations, people living in unimaginable poverty. Their book is a call to consider what it means when more than a million families are living on virtually nothing, and what our responsibility is to make a path to prosperity for these Americans. 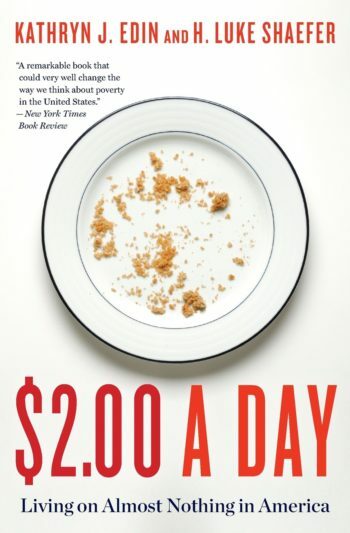 A remarkable book that could very well change the way we think about poverty in the United States. With any luck (calling Bernie Sanders) this important book will spark election year debate over how America cares for its most vulnerable. Affluent Americans often cherish the belief that poverty in America is far more comfortable than poverty in the rest of the world. Edin and Shaefer’s devastating account of life at $2 or less a day blows that myth out of the water. This is world class poverty at a level that should mobilize not only national alarm, but international attention. This searing look at extreme poverty deftly mixes policy research and heartrending narratives… Mixing academic seriousness and deft journalistic storytelling, this work may well move readers to positive action. A close-up, heartbreaking look at rising poverty and income inequality in the U.S.